Educators should use this as an overview of the many impacts that climate is and will have on terrestrial and marine life and their habitats. It can be used in conjunction with other components of the Climate Change Wildlife and Wildlands Toolkit. Student could be sent to explore ecoregions using http://www.globalchange.gov/resources/educators/toolkit/explore and compare and contrast climate change evidence in these regions. Video was produced by the US Fish and Wildlife Service and its federal agency partners in the US Global Change Research Program. Comments from expert scientist: I think this a modest introduction to Climate Change- specifically giving examples of organisms that are being impacted. This is very watered down and oversimplifies the issue. The video is a breezy overview of many topics related to climate change and its impacts on terrestrial and marine life. It does not review any of this material in any substantive way. The narration and interviews are done in a way that should appeal to young audiences. 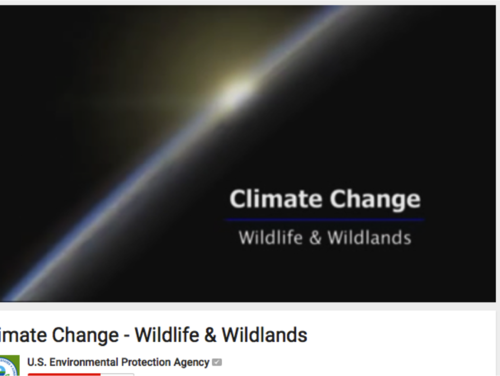 This video is part of a toolkit that includes a Climate Change Wildlife and Wild Lands Teachers' guide, Frequently Asked Questions, and a downloadable glossary of scientific terms. These items and more are available under the 'Materials' link. It can be used in classrooms as an introduction to the topics or in visitor centers and interpreter talks in informal educational settings. The video is well-produced and engaging. The videos, animations, images and music are well-chosen.